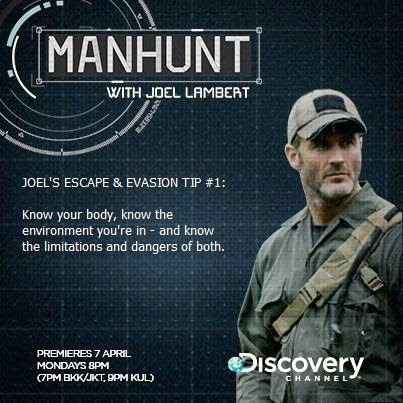 Discovery Channel launched its newest TV series, Manhunt with Joel Lambert, in Manila held at Greenbelt 3 Cinema 5 (Makati, Philippines) on March 31, 2014. 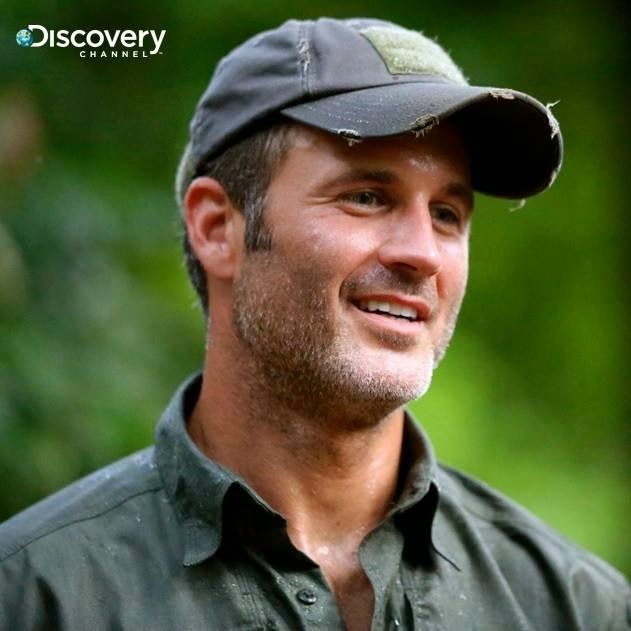 Known for its engaging line-up of high-quality non-fiction entertainment, Discovery Channel gave a sneak peek of how it is to hunt a criminal in real life, showing us the 6th Episode: “Escape the Jungle” shot at Mt. Sta. Rita in Zambales, Philippines. This particular episode is scheduled for airing on May 12, 2014. The program also had an open forum where media had a chance to ask questions for Joel Lambert and the Philippines' Army Scout Rangers (ASR) headed by its Field Commander, Lt. Jerson Jurilla. This event was hosted by Rovilson Fernandez. Each week, he goes into unknown territory - in the Philippines, South Korea, Poland, America, South Africa and Panama - with nothing but a basic survival kit and a tumbler of water. He must then evade capture and reach a pre-determined extraction point within two days. Will his training, skill and cunning be enough to help him escape? 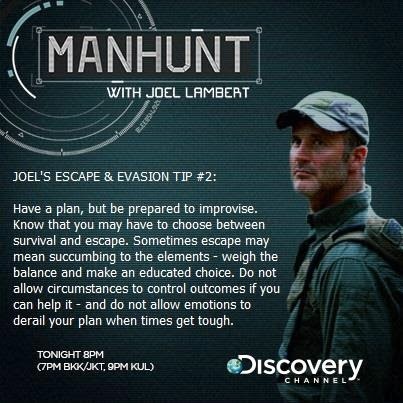 Manhunt with Joel Lambert premieres on April 7, 2014 (Monday) at 7:00 p.m. (Indonesia); 8:00 p.m. (Philippines/Singapore); 9:00 p.m. (Malaysia). The all-new Discovery Channel series Manhunt with Joel Lambert, pits former U.S. Navy SEAL and escape and evasion expert Joel Lambert in a real-life, extreme version of hide-and-seek against some of the globe’s most elite military and law enforcement tracking units – the Philippines Army Scout Rangers, South Korean National Police (K.NP) SWAT, Panama's anti-drug trafficking unit Servicio Nacional de Fronteras (SENAFRONT), Poland’s border guard, the Straz Graniczna, and more. The stakes are extraordinarily high as the seven-part original series puts Joel’s evasion and escape skills, and the readiness of these national hunter force agencies to the ultimate test. To capture Joel, these highly trained tracking units can use any assets available to them in a real world manhunt, unlike Joel, who is provided with minimal supplies to survive – for anything else he needs, he must search for along the way. Armed with only a basic survival kit and his wits, Joel is dropped on location in the Philippines, South Korea, South Africa, United States, Poland and Panama with a head start. He only has up to 48 hours to reach a pre-determined extraction point that only he is aware of – while being pursued by a different hunter force agency each week as well as having to face treacherous terrains and deadly wildlife such as lions, leopards, rhinos and more – or risk being captured. 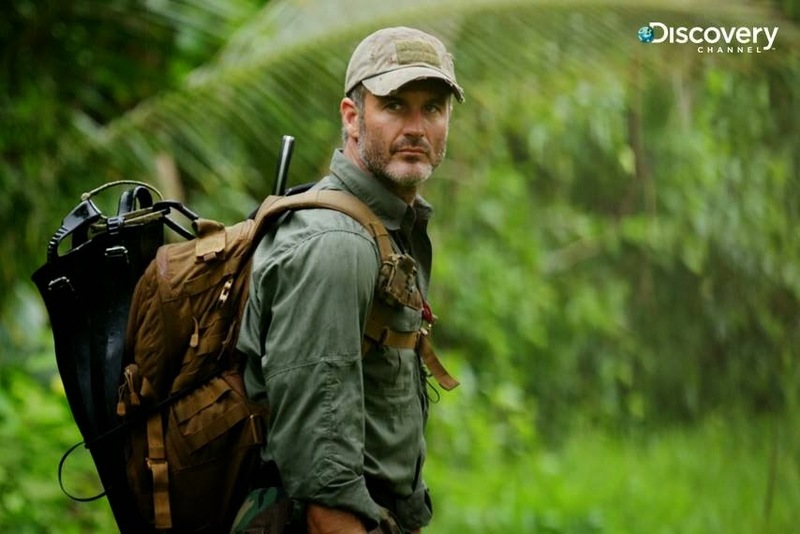 Joel’s game plan is to employ diversionary tactics and infiltration and evasion techniques gleaned from his 10 years of experience as a Navy SEAL, demonstrating different strategies developed in response to varied environments and the specific skills set of each tracking unit. Viewers are brought alongside the heart-stopping action and unexpected turns firsthand via cameras that capture the intense chase from both perspectives up close. Learn the techniques used by each elite hunter force during combat or crisis situations, and how to minimise getting spotted and caught. Joel’s background has well-positioned him to prey on each unit’s hidden flaw – but evading highly specialised tracking units and combatting dehydration, hunger, and the elements might prove to be a greater challenge than he perceives. Will his experience and skills be enough to help him escape – or will the he fall victim to his hunters…or the environment? The hunt is on. Manhunt with Joel Lambert encores every Friday at 3:00 p.m. and 11:00 p.m., Saturday at 5:00 p.m., and Sunday at 10:00 p.m. Kicking off the series is an inside look behind-the-scenes at MANHUNT, Discovery Channel's all-new action/survival series – and the dangerous conditions battled during production. Joel Lambert, an ex-Navy SEAL, takes on some of the world’s most specialised military and law enforcement tracking units, as he puts them to the tests and challenges them to try to physically capture him over a period of up to 48 hours. Shot in some of the most remote and exotic locations of the world, viewers meet each of the hunter forces and hear about the difficulties Joel experienced in trying to escape and evade each one. The making of the series proves just as challenging as severe injuries and near-death accidents plague the crew all while trying to capture this ultimate game of cat-and-mouse. Joel is hunted across a private game reserve in South Africa as he faces off against one of the most specialised forces yet – the International Anti-Poaching Foundation (IAPF). With the reserve full of deadly animals such as lions, leopards, elephants, and rhinos, Joel must be hyperaware of both the hunter force behind him – and the dangerous game ahead. Comprised of ex-military and ex-poachers, the IAPF’s keen tracking skills allow them to spot even the faintest hint of Joel, without the aid of high tech assets. But when the IAPF finds a pride of lions on the prowl, the hunt changes to a life-and-death rescue mission to find Joel before he becomes a lion’s lunch. Joel has just 36 hours to escape and evade Poland’s elite border guard, the Straz Graniczna. Over a distance of 25 kilometres, the border guard deploys all their assets, including thermal camera helicopters, all-terrain vehicles (ATV), motorcycles, tracking dogs and world class field units, in an attempt to intercept Joel before he reaches his extraction point. As the Straz Graniczna mobilises dozens of troops, Joel is forced to utilise all of his deception tactics – not to mention, make his way down a 20 metre cliff, and risk a daring truck ride – to attempt to save himself in this battle of Polish pride versus Joel’s rigorous training. Panama's elite anti-drug trafficking unit SENAFRONT has just 36 hours to track, hunt and capture Joel through the jungles of San Jose Island, situated close to 100 kilometres off the coast. Joel battles for his freedom through thick rainforest, rocky shorelines, and some surprising wildlife, while SENAFRONT unleash their full arsenal, using ATV patrols, boat units, and ground trackers to pressure Joel from all sides. But when Joel decides to use the natural terrain to conceal his trail, SENAFRONT turns the tables by using one of Joel’s signature moves against him. Joel faces off against the U.S. Army's Phantom Recon unit – a battle-tested group of trackers, supremely skilled in hunting down the most elusive of enemy targets. Their turf in southern Arizona is the harsh 75,000 acres of terrain surrounding Fort Huachuca military base, an area home to mountain lions and bears – and a much-favoured route of illegal immigrants and heavily armed drug smugglers trying to gain passage into the country. If Phantom Recon is not intimidating enough, Joel is also being monitored by a squadron of sophisticated unmanned aerial drones, whose cameras have locked in on his every move. With Joel pitted against both top-notch trackers and the latest aerial spyware, will his skills and endurance be enough to get him to a successful extraction before the “enemy” closes in? Joel faces off against the Philippines Army Scout Rangers, with just 48 hours to escape the dense jungle. Over a distance of 25 kilometres, and with two trucks as their only assets, the Scout Rangers prove they are among the world’s best at jungle tracking as they utilise their unique skill set to stay hot on Joel’s trail. But the harsh heat and humidity of the Philippines jungle – and an unfortunately timed typhoon – push Joel, the hunter unit and crew to the brink. Joel takes on the South Korean National Police (KNP) SWAT unit in a challenge like he has never faced before – an urban evasion. Situated on the heavily populated and highly trafficked tourist island of Jeju, Joel must alter his tactics to escape the KNP’s web of over 5,000 closed-circuit television cameras, in addition to their boat, air and mobile assets. Nothing is off-limits to Joel as he tries to avoid physical capture through the back alleys of the city. But when the pressure of the KNP becomes too much for Joel, he leads them out into the wilderness on a wild path of deception and near misses.